Grains seeing a little strength this morning with beans up 4 cents, wheat up 10 cents, and corn up 2 cents. Brazil will have their Presidential election on Sunday. Bolsonaro still holding the lead. Traders think that Russian wheat exports will be shut off by January, but they don’t expect any government intervention to slow the export pace. ABARES lowered their Australian winter grain production estimate by 15%, and wheat production by 13% to 16.53 MMT. The U.S. economy likely slowed in the third quarter, held back by a tariff-related drop in soybean exports, but economists are anticipating a roughly a 3.3% increase. 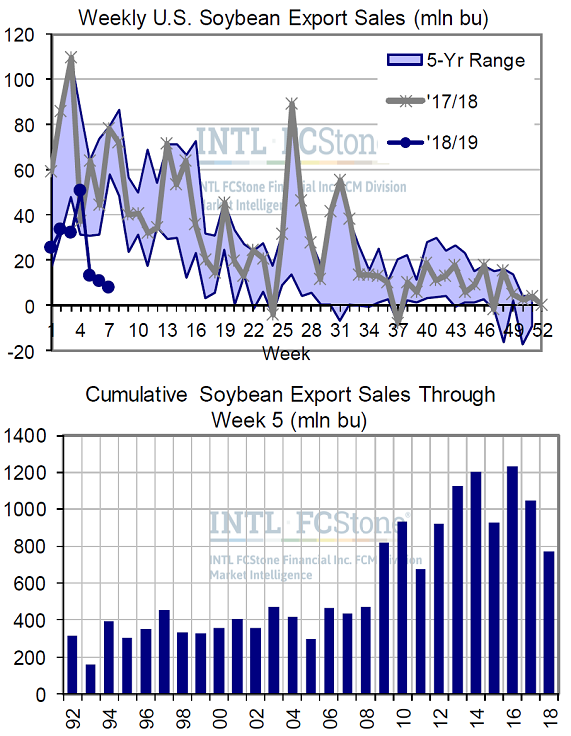 Absent a single key buyer (China cancelled a net 2.2 million bushels and “unknown” cancelled another net 19.5 mbu this week), the 2018/19 U.S. soybean export campaign continues to be a disaster, with weekly sales of only 7.8 mbu, the third straight declining sales week and way behind a comparable week right at 10 times that last season. Cumulative sales stand at 774 mbu, now over 270 mbu behind last year through just over a month and a half; the USDA is still only looking for a 69 mbu YoY bean export decline.